The DOD, contrary to the intent of this section of the act and the instruction of chairman Hunter, retained Dr. Jon Nordby to investigate the death. Nordby generated a report in late 2004 (www.meixatech.com/NORDBY.pdf ) and another in 2005 (www.meixatech.com/NORDBY2.pdf ), both of which determined the colonel committed suicide. Nordby’s science was outrageous by any measure, which is not surprising since he has no formal training in the sciences prior to receiving his Ph.D. in philosophy. Dr. David Sabow, a forensic neurologist and brother of the colonel, was asked by Hunter to evaluate the first Nordby report. Sabow identified numerous errors in Nordby’s analysis (www.meixatech.com/EVALNORDBYREPORT-SABOW.pdf ). I was retained after the first Nordby report, under the authority of Hunter, to help address the issues presented by Nordby, specifically gunshot residue and crime-scene reconstruction. Sabow and I then collaborated to produce our own report, which came to the conclusion the colonel was the victim of a homicide. We submitted our report to Hunter to assist him in his investigation of Sabow's death. Our report (later separated into two reports) certainly did so. Although a few aspects of the report have had minor changes due to new evidence becoming available, our conclusion remains: Sabow’s death was by homicide. These reports, www.meixatech.com/SABOW&BURNETT.pdf and www.meixatech.com/BURNETT&SABOW.pdf ), have been updated from those seen by Hunter. After reviewing the opposing reports, Hunter expressed the opinion to his staff that Sabow was murdered. Hunter followed this personal determination by requesting U.S. District Attorney Alberto Gonzales to take over the investigation (www.meixatech.com/HuntertoGonzales2007.pdf ) but was turned down. Gonzales claimed the case was not in the jurisdiction of the federal government despite the death occurring on a U.S. military base (www.meixatech.com/DoJtoHunter2007B.pdf ). Hunter left office without further comment or action on this matter. Evidence shows Sabow sustained a powerful blow to the back of his head in the right occipital region, which knocked him unconscious, fractured his skull and severely damaged his brain stem. The injury from the blow ultimately led to the colonel’s death. There was a massive hematoma over the skull fracture as well as heavy swelling on the right side of Sabow’s neck (www.meixatech.com/SABOW&BURNETT.pdf). A 12-gauge shotgun was discharged intraorally following the colonel’s death. The autopsy of the colonel was performed by the Orange County Coroner’s Office. Bizarrely, the medical examiner claimed suicide although the autopsy report (www.meixatech.com/SABOWREPORTAUTOPSY.pdf ) and photographs, autopsy and crime scene can only support homicide. In 1993, the widow and brother (Dr. Sabow) of the colonel filed suit against the DOD in U.S. District Court, Central District of California Southern Division (SA CV 93-991). Evidence shows the DOD took possession of the 35mm negatives of the autopsy of the colonel. Both the Orange County coroner and the DOD generated photographic prints from the negatives. The DOD released autopsy photographs from the negatives in response to the discovery request by the plaintiffs. Neither the DOD nor the Sabow family knew at the time the Orange County coroner also made prints of the autopsy negatives for their file. Figure 1A. The modified photograph of the pre-autopsy photograph (rotated 90 degrees) shown in B; the swelling of the upper right neck was hidden by airbrushing and depression of the right head (due to skull fractures) was hidden by the masking procedure. B. The original photograph released by the Orange County coroner in 2012. In 2011, while I was reviewing some of the DOD-generated autopsy photographs of the colonel, I realized the pre-autopsy photograph of the posterior upper body and head (Figure 1A) had unusual characteristics, unlike any of the other autopsy photographs, which led me to question its veracity. Overwhelming support for the questioned photograph being fraudulent came the following year. The Sabow family, through their lawyer, compelled the Orange County coroner to release copies of the contents of their colonel’s autopsy file. To the surprise of all involved, autopsy photograph prints were in the file. Among these photographs was the unmodified photograph (Figure 1B) of the one from the DOD that had been questioned. The modified photograph (Figure 1A) was constructed to deceive. Analysis of the modified photograph revealed it was constructed by darkroom manipulation using a mask as well as airbrushing. The goal was to hide the swelling on the right side of the colonel’s lower head and upper neck. This work was peer-reviewed and presented in February 2014 at the annual meeting of the American Academy of Forensic Sciences (www.meixatech.com/MANIPULATED PHOTOGRAPHS.pdf). A manuscript (www.meixatech.com/FRAUDULENTIMAGES.pdf ) where my findings are presented will be submitted to a journal before the end of this year. Figure. A. The cover page and page 16 of the first Nordby report in PDF format released in 2013 in response to a Freedom of Information Act request to the DOD. The release of this report in 2004 was by fax and the images were unusable due to poor quality. B. The image shown in A extracted and enlarged; low resolution, JPEG rectangle artifacts and PDF artifacts severely restricted analysis. 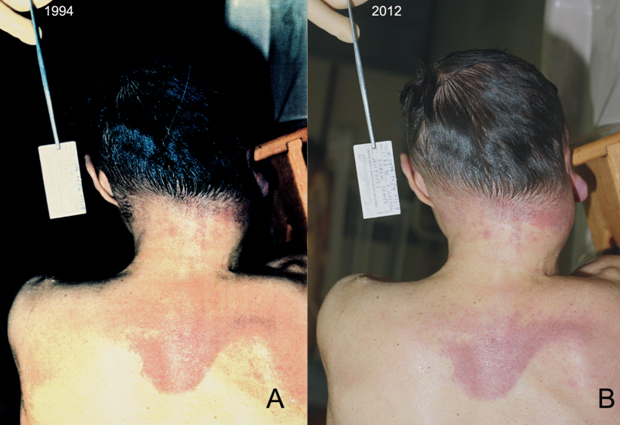 However, the extracted image from the PDF document caused a color shift (black to deep red) mainly in the right neck, showing part of the actual swollen area (at arrow). This area of focused modification was also the in the first modified photograph. The manipulation by imaging processing for this second fraudulent photograph was obviously poorly done. C. The unmodified photograph from the Orange County coroner for comparison. 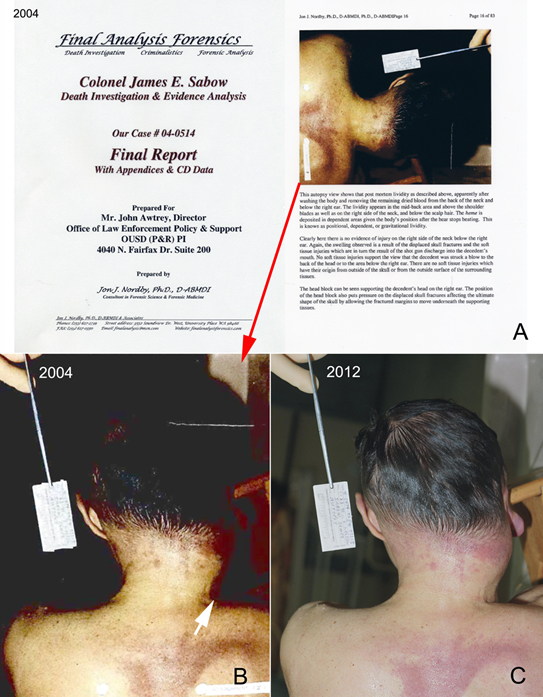 Another fraudulent photograph (Figure 2), constructed from the same unmodified pre-autopsy photograph (Figure 2C) by image processing, was provide by the DOD to Dr. Nordby for his first report in 2004 (www.meixatech.com/NORDBY.pdf) to the US Congress. Nordby used this fraudulent photograph as support for his conclusion that Sabow committed suicide. In 2010, Naval Criminal Investigation Service (NCIS) Special Agent and cold-case investigator Julie Haney of Camp Pendleton, perhaps initially unbeknown to her superiors, started work on the Sabow case. In her letter of intent, she states she is “reinvestigating the suicide case” of Col. Sabow (www.meixatech.com/Haney-Wheaton.pdf). She allegedly reviewed Nordby’s and our reports and told me and others in our ad-hoc group there was no question in her mind the Sabow was the victim of a homicide. One of the individuals in our ad-hoc group then got world-renowned forensic pathologist Dr. Werner Spitz to review the case. Spitz submitted a notarized report to investigator Haney (www.meixatech.com/SABOWREPORT-SPITZ.pdf ), in which he concluded homicide. Several days after that report was released, Spitz verbally rescinded (i.e., changed his conclusion to suicide) without written explanation, nor could he supply an adequate verbal explanation when asked by Dr. Sabow (www.meixatech.com/DSABOW-HANEY.pdf ). Haney then dropped her investigation, allegedly based on Spitz’s verbal report and a one-hour “consultation,” in which I was excluded, with San Diego County Medical Examiner Dr. Glenn Wagner. However, Robert Romaine, a private investigator involved with the case, was invited to attend that meeting the day prior to it. Romaine had difficulty understanding some of the conversation between Haney and Wagner, but recounted parts of that meeting (www.meixatech.com/SABOWREPORT-ROMAINE.pdf ). It appears Wagner did not review any of the reports in this case (he did not have time as my report was presented to him at the meeting), nor did Haney apparently present any of the observations and conclusions by Dr. Sabow and me. Wagner rendered an opinion at the end of the meeting that Col. Sabow committed suicide. I cannot see how any professional could come to a legitimate conclusion on a complex death investigation after only an hour’s examination, and then restrict it to a verbal opinion. I was outraged I was not invited to participate in the meeting even though I live in San Diego County and could have easily attended. It is apparent from investigator Romaine’s account that Wagner focused on the fraudulent autopsy photograph (the meeting occurred more than a year before the discovery of the fraudulent autopsy photograph) (www.meixatech.com/SABOWREPORT-ROMAINE.pdf and personal communication, August 2014). Following that meeting, I tried to arrange a lunch presentation of my analysis and conclusions at the San Diego County medical examiner’s facility, through Dr. Madeleine Hinkes, the medical examiner’s chief anthropologist (www.meixatech.com/SABOWREPORT-ROMAINE.pdf ). Dr. Hinkes told me Dr. Wagner turned down my proposal. Apparently, Wagner wasn’t interested in an opposing viewpoint and the prospect that his determination could be in error. These events suggest the meeting was a sham to give Haney an excuse to drop her investigation. Amazingly, Julie Haney was actually at the scene of the colonel’s death in 1991and likely previously knew details of that death investigation. She did not volunteer (claimed it was not relevant) to being present until one of our ad-hoc members, Gene Wheaton, pinned her down (www.meixatech.com/Haney-Wheaton.pdf also www.meixatech.com/David Nicholas.pdf ). Haney sent Dr. Sabow a one-page letter of her findings (www.meixatech.com/SABOWREPORT-HANEY.pdf ). Haney had most of the reports, including those by Drs. Sabow and Nordby and me, but this letter indicates she had no ability to understand the issues or even identify them -- issues that conflicted in these reports which require a critical, neutral evaluation are the pathology, GSR distribution on the clothing of the colonel, bloodstain/spatter evidence, staging of the death scene, etc. Dr. Wagner should have not only have recognized Haney was not qualified to present a case to him, but also that he was being presented only part of the discovery in the case. It is surprising that Haney, a veteran of many investigations for the NCIS, handled a case with such incompetence. If she represents the quality of investigative personnel within our military, our country is truly at risk. All federal government branches are prohibited from unilaterally thwarting the legitimate ends of a criminal investigation (United States v. Nixon, 418 U.S. 94 S.Ct. 3090, 41 L.Ed. 2D 1039 (1974)). There was no instruction from Congressman Duncan Hunter Sr. restricting my investigation into Col. Sabow’s death either in scope or time. Dr. Sabow’s and my authority from Congress are still active. It is apparent the DOD has been and likely still is actively interfering (e.g., fabrication of evidence and likely witness/investigator tampering) with a homicide investigation in violation of the law. The fraudulent autopsy photographs, fabricated by the DOD, have influenced the opinions of some experts (e.g., Dr. Nordby and likely Dr. Wagner). Just the existence of the fraudulent photographs shows there is a criminal element within the DOD, likely behind the homicide of Col. Sabow, who will stop at nothing, short of additional homicides, to keep the Sabow homicide hidden from public view. I have provided links to the evidence and reports cited in this case. I invite critical scrutiny (brburnett@meixatech.com ) of the documents, especially those from myself, Dr. David Sabow and Dr. Jon Nordby. Bryan Burnett lives in Cardiff-by-the-Sea, Calif. He is a gunshot-residue and digital-imaging expert as well as a certified crime-scene reconstructionist, and has more than 70 publications spanning more than 40 years in seven fields of science (www.meixatech.com/cv.pdf).